Chardham is the name given to the four most divine pilgrimages of India comprising Yamunotri, Gangotri, Kedarnath and Badrinath located in the state of Uttarakhand. According to Hindu legends, undertaking a journey to the Chardham in Uttarakhand helps one to wash away sins and get Moksha. From time immemorial, devotees and saints from around the world have been visiting these sacred shrines to quench their spiritual urges and get god’s blessing. While most of the people are aware of only these popular facts associated with the four religious dhams, there are yet many other unknown facts that are hardly known to the devotees. As per the Hindu tradition of parikrama, pilgrims undertake this holy journey from left to right. Pilgrimage to Chardham yatra begins from Yamunotri Temple, the westernmost shrine in the Garhwal dedicated to the Goddess Yamuna, before proceeding to Gangotri Temple which is devoted to Goddess Ganga, and then further moves to Kedarnath temple which stands as one of the 12 ‘Jyotirlingas’ of Lord Shiva and finally concludes at Badrinath temple which is devoted to Lord Vishnu. The sacred sites of the Chardham in Uttarakhand are not allied to any single sect. Rather, it represents three major sectarians with the Vaisnava site at Badrinath, joined by a Saiva site at Kedarnath and two Devi sites at Yamunotri and Gangotri. The original shrine of Lord Badrinath was not where it is today. According to history, the original Badrinath idol was discovered by Adi Shankaracharya in the Alaknanda River and the temple of Lord Badrinath was built in the Garud Caves, which are located near the hot springs of Tapt Kund. Many centuries later, the king of Garhwal moved the shrine to its present location. Located near Gangotri temple, Jalamagna Shivalinga is a natural rock Shivling which is visible only during the winter, when the level of the water goes down. This site is believed to be the place where Lord Shiva held Ganga in his matted locks. Located close to the freezing Yamunotri glacier, Surya Kund is another hot water spring which holds an important religious significance. The water of this spring is so hot that the Prasad is prepared in the water of kund only that too within just a few minutes. According to the historical facts, the initial temple of Kedarnath which now stands adjacent to the present temple was built by the Pandavas. After winning the battle of Mahabharata, the Pandavas felt guilty of killing their own brothers and therefore came here in search of Lord Shiva, who kept hiding from the Pandavas. Finally Bhima, one of the Pandava brothers was able to recognize the Lord who was hiding in the guise of a bull. Thereafter, Lord Shiva runaway from that place leaving behind his back part. Even today, the hind part of Shiva is worshipped in Kedarnath. Situated at a height of 6500 feet, Gauri Kund serves as the base camp for the pilgrims on their way to Kedarnath. It comprises a temple and a hot water spring dedicated to Goddess Gauri. According to legends, Gauri Kund is a place where Goddess Gauri, wife of Lord Shiva carried out her yogic practices. It is believed that the existing site of the Badrinath temple was once an ancient Buddhist shrine, probably before the 8th century, because of its noticeable Buddhist architecture. According to the hindu mythology, the present Badrinath and Kedarnath temples will become inaccessible in future. 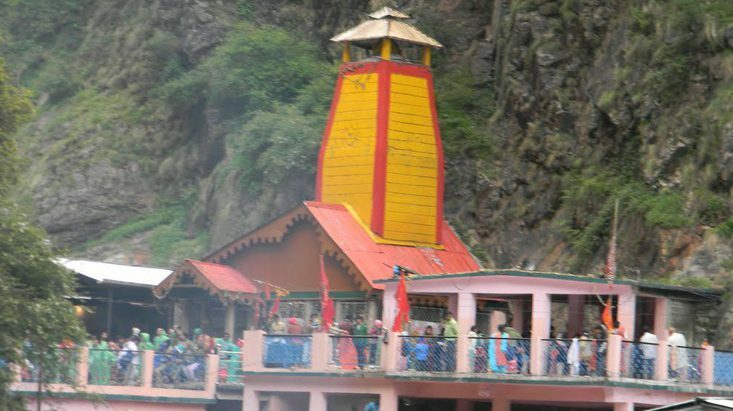 This is because it is believed that when the arm of the Narasingha idol at Joshimath falls off and the two mountains Jay and Vijay near Vishnuprayag become one, the way to the pious Badrinath and Kedarnath temples will become unapproachable. After that the worship of Lord Vishnu proceeds at Bhavishya Badri near Joshimath. At present, the arm of the idol of Narasingha is as thin as a single hair, which means that there is still time for Bhavishya Badri to appear as new Badrinath. The Shrine of Badrinath is divided into three parts, i.e. the ‘Garbha Griha’ in which the idol of Lord Badrinath is seated and covered with gold sheet, the ‘Darshan Mandap’ in which rituals are performed and the ‘Sabha Mandap’ where devotees gather and wait for darshan of Lord Badrinath. Located just below the Badrinath temple, Tapt Kund is the holy hot water spring where devotees take bath before visiting the Badrinath temple. The water of the kund is believed to be infused with medicinal properties. The springs of Tapt Kund are known to be the home of Lord Agni, the Hindu God of fire. There are many scientific reasons and legends behind the ban of the conch in Badrinath temple. One of the famous legends states that when the great sage Agastya was killing the demons in Kedarnath, two demons Vatapi and Atapi managed to run away. While demon Atapi took shelter in the Mandakani River, demon Vatapi took refuge in the conch to save his life. It is supposed that if anyone blows the Conch, the Vatapi demon would come out of the conch. So, the conch is not blown in Badrinath. Knowing these facts about the Chardham Yatra is worthwhile for all those who are planning to proceed on this route in search of salvation from the sins of their previous birth. Make sure to update yourself with all these facts which are worth knowing before you actually land in this divine place.